It's said that we know less about what's in the depths of the ocean than what's beyond our solar system. "The impact we have had on ocean ecosystems has been vastly underestimated," said co-author Boris Worm of Dalhousie University and the University of Kiel in Germany. "These are the megafauna, the big predators of the sea, and the species we most value. Their depletion not only threatens the future of these fish and the fishers that depend on them, it could also bring about a complete re-organization of ocean ecosystems, with unknown global consequences." Concentrations of phytoplankton in the world’s oceans have decreased 40 percent since the 1950s, according to a new study. Using nearly a half-million sources of oceanographic data from the last 60 years, researchers at Dalhousie University in Nova Scotia concluded that the decline of the microscopic organisms correlates with an increase in sea surface temperatures, which leads to increased thermal stratification of the oceans. That stratification limits the upwelling of nutrients from colder waters that feed phytoplankton. Since phytoplankton form the foundation of the aquatic food chain — providing the major source of food for zooplankton, which is a critical part of the diet for larger species — scientists say this trend poses a threat to marine ecosystems worlwide. 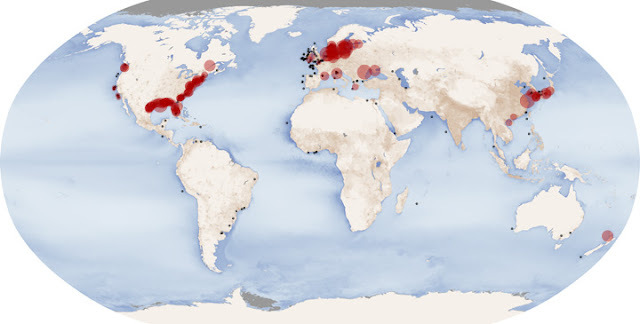 A new NASA map illustrates the significant expansion of the world’s marine dead zones, deepwater regions where dissolved oxygen is so low marine species cannot survive... 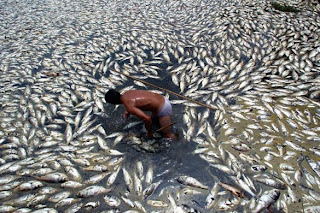 In 2008, a study found that dead zones had spread exponentially since the 1960s, affecting more than 400 ecosystems and a total area of more than 152,000 square miles (245,000 square kilometers). Puget Sound, its abundant sea life, and all that depend on it, are in mortal peril. Will we deny and delay until everything is dead?